There are probably many unadvertised jobs in the job market, maybe they are even more than advertised jobs so it can be good idea to send covering letters for these type of jobs. If following example is not enough for you then click here to view 5 more Speculative covering letters. For an email cover letter, there is a separate platform. You may be able to find email cover letters examples online. The fact that prospective buyers or employers receive many emails daily,it is important that no single lead detail is missed out. Observe protocols and ethics in email messages so that you get a better chance of being read. Make certain that you follow strictly instructions of the email recipient. This is especially for those applying for a job online. Be conscious of the format as instructed. Fill out the required fields such as addressee and subject and attachments that include your CV. The salutation should bear the name to whom the cover letter must be addressed. The helpful tips will be your guide to a powerful cover letter for sales,resume submission and for any intention that you might have. For fax messages,there are also protocols to observe,just like any other hard copy cover letters. It is very important that the letter introduces you,your product if you are into sales,your skills and experiences,if you are applying for a job,the type of service,if you are offering a service. So,if you want to make your reader get interested in you to lead him/her into the crucial details of yourself,service or product –then finding out more ideas from cover letters examples online is most advisable. 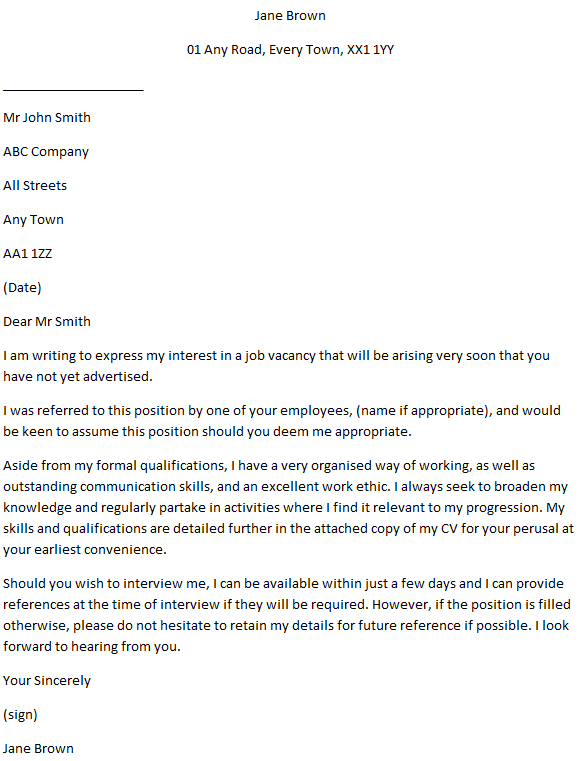 I am writing to express my interest in a job vacancy that will be arising very soon that you have not yet advertised. I was referred to this position by one of your employees, (name if appropriate), and would be keen to assume this position should you deem me appropriate. Aside from my formal qualifications, I have a very organised way of working, as well as outstanding communication skills, and an excellent work ethic. I always seek to broaden my knowledge and regularly partake in activities where I find it relevant to my progression. My skills and qualifications are detailed further in the attached copy of my CV for your perusal at your earliest convenience. Should you wish to interview me, I can be available within just a few days and I can provide references at the time of interview if they will be required. However, if the position is filled otherwise, please do not hesitate to retain my details for future reference if possible. I look forward to hearing from you. I suppose the good thing about sending letters concerning jobs that are not advertised is the fact that the employers won’t be swarmed with hundreds of letters. Of course, yours is unlikely to be the only one, as many other people may have had the same idea, but at least the volume of paperwork will be a lot less. Because of this, you may catch the employer’s attention and they may contact you rather than advertise the job. Advertising jobs becomes very expensive, so you’re doing them a favour getting in touch!